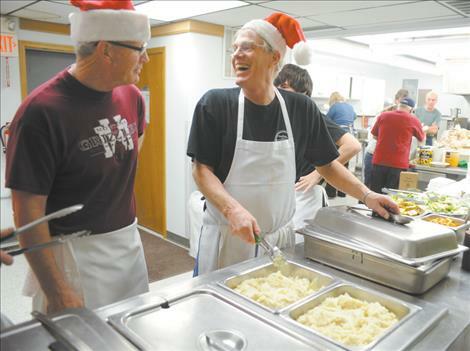 Burt Cannon, center, demonstrates how to scoop mashed potatoes on the serving line for the Christmas dinner at the Ronan Community Center. 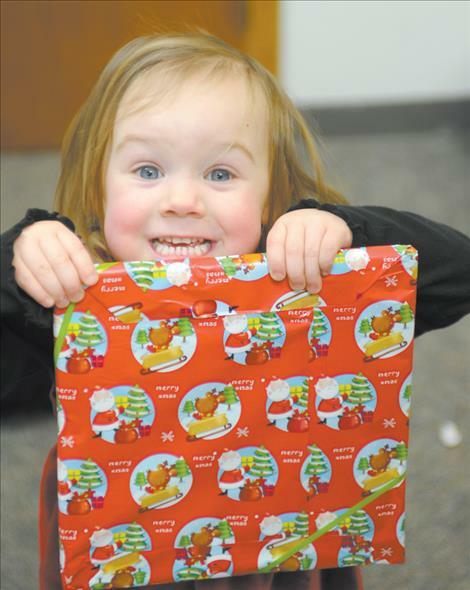 Kila Cannon excitedly displays a gift Santa gave her during a community Christmas dinner held Dec. 25 at the Ronan Community Center. 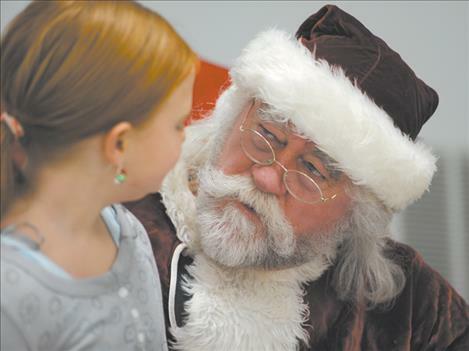 Santa Claus chats with Kiera Den Dekker at the Christmas dinner Dec. 25. 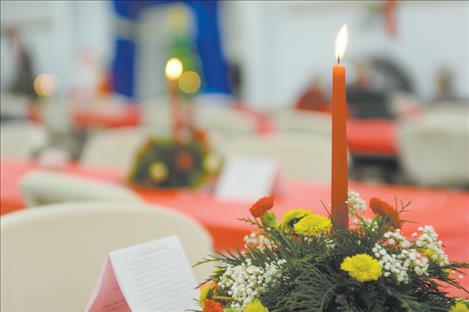 Jim Blow/Valley Journal Festive centerpieces donated by Bev's Bloomers added a joyful touch to each table at the community Christmas dinner. Jim Blow/Valley Journal Marie Cowen adjusts her festive cap before sitting down for her meal at the Traditional Christmas Day Dinner held at the Ronan Community Center on Christmas Day. Cowen had so much catching up to do with friends that her dinner began to get cold. "That's fine. Cold dinner doesn't bother me," the former cafe owner smiled. "I actually digest it better when it's cold." RONAN — By 3 p.m. Christmas Day, more than 300 residents of Lake County, Missoula and Kalispell were stuffed to the brim, thanks to a fantastic feast and loads of Christmas merriment and joy. There wasn’t one iota of food left over from the popular Traditional Christmas Day Dinner, save a bowl of gravy. The Ronan Pizza Café and the Ronan Area Chamber of Commerce put on the free dinner, though donations were accepted to benefit the Boys and Girls Club of the Flathead Reservation. People from Kalispell to Missoula enjoyed the community Christmas dinner which boasted 13 turkeys, seven hams, 130 pounds of mashed potatoes, 100 deviled eggs, 500 dinner rolls, a multitude of vegetables, numerous salads and eight pumpkin pies. The tables were also decorated with three centerpieces on each table donated by Bev’s Bloomers. Each table was completed with candles, illuminating a cozy Christmas glow on the Ronan Community Center. Cannon, who owns the Pizza Café, was one of the main organizers of the event. After working four 18-hour days, his own family’s Christmas celebration had to be postponed until Sunday evening. Members of his family were also among the 50 volunteers who set up, served and cleaned up after the dinner was over. A jolly Saint Nick made a special appearance, toys in tow for all the boys and girls who attended the event. Toys were donated by Toys for Tots to about 30 children. More people attended the Christmas dinner this year than last and the program made over $700 for the Boys and Girls Club.